If you are traveling to Stockton, California and love food, we have created the ideal itinerary for your foodie visit. There is plenty to choose from so please understand this is just a sampling. Everything from comfort food to fine dining, burgers to Asian cuisine are offered here in Stockton. As you walk through this city you sense the local appreciation for diverse dining. Each trip to Stockton is inevitably a foodie trip, so enjoy our guide and make the most of your stay. You cannot ciome to Stockton without visiting Chuck's Hamburgers, located inside Pacific Avenue Bowl. 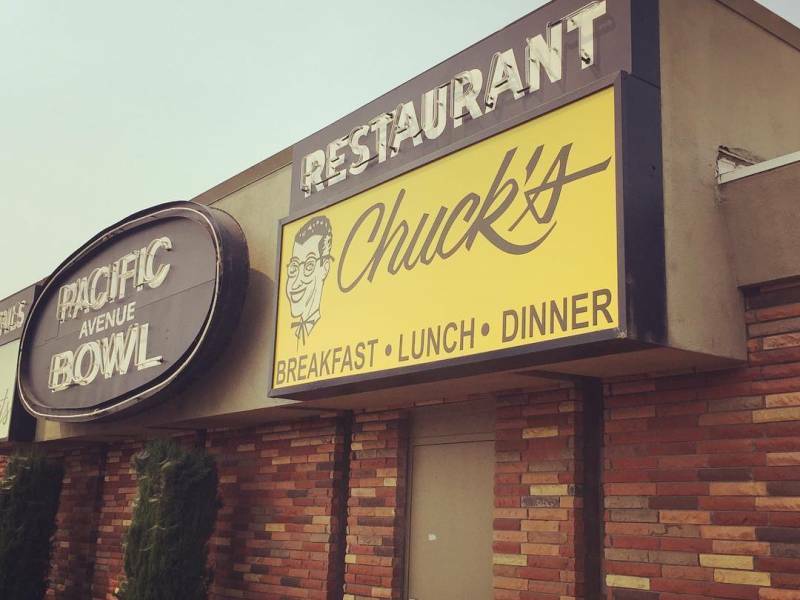 This old-fashioned diner has been a Stockton institution since 1960, and was featured on California's Gold with Huell Houser! The portion sizes are crazy huge, big enough to share, so bring a hearty appetite to enjoy the giant pancakes and crispy French toast platters. The welcoming vibe makes this an enjoyable place to eat. Fill your belly here and be prepared to be stuffed for hours! Added bonus: Get 15% off your entire bill with the Stockton Savings Pass! Following breakfast, hit the lanes for some bowling fun. Bowling makes for a perfect indoor activity when the weather is unpleasant, and you will burn off those delicious breakfast calories! Well digested and ready for more, move up the street and enjoy dinner at Market Tavern, for a truly unique “farm-to-fork” dining experience. This restaurant, situated in Lincoln Center, is stocked full of farm-fresh ingredients and boasts wood-fired pizzas, all natural steaks, and signature craft cocktails. They pride themselves on serving up a wide variety of locally-sourced dishes, so there’s something to suit everyone. The staff is welcoming and attentive, which only adds to the all-around excellent dining experience. Pro move: This restaurant is bursting at the seams with hungry people, so be prepared to wait, or book a table online. Whether you prefer exotic ingredients, fresh fruits, vegetables, or seafood, the Downtown Stockton Asian Farmers' Market is where you can find it all. Opened in 1979, this popular market draws thousands of people (and foodies alike) from around the region, and is considered one of California’s oldest and most successful markets today. You can find local producers setting up tents and tables under what locals call the ‘Crosstown Freeway’ (Highway 4), putting their best produce and herbs on display where foodies can trek in to purchase farm-fresh food. Straight from the farms to your table — that is how we do things here in Stockton, California! Pro move: Visiting early is highly recommended. Items can sell out quick! To continue your appreciation of authentic Asian flavors, a visit to Green Papaya Restaurant should be on your list. Green Papaya Food Truck recently opened a Thai restaurant in an unassuming strip mall. The food truck was featured on Food Network’s "Diners, Drive Ins, and Dives!" and is popular among locals. The truck continues to dish out mouth-watering Lao and Thai cuisine to the streets of Stockton, but if you cannot find the truck, a visit to the restaurant is a must! Take a moment to digest your wonderful meal by immersing yourself in a sea of blooming beauty at the University Park World Peace Rose Garden. This is an incredible, colorful haven for all ages! This rose garden is a showstopper from May through September, and you may see the bees at work with their cross-pollination. The garden is situated inside University Park and it truly is a fragrant site. Trust us when we say you will need the walk before your next stop - on to dessert! You might not find the famed Museum of Ice Cream in Stockton, but there are plenty of parlors to find good-tasting ice cream. Best of all, ice cream can taste good anytime of the year. Whether it is 110 degrees or 65 degrees, savor this chilly list of places that serve delicious ice cream around Stockton. Pro move: Tag your Insta-worthy ice cream photos with #visitstockton for a chance to be featured. If you are visiting in the summer, start your day paddleboating (weekends only April - October) on the lake at Stockton's Oak Grove Regional Park so you are good and hungry for brunch. This 180-acre park situated in a beautiful oak-forest setting features walking trails, playgrounds, fishing, two disc golf courses, and paddleboats. Pro move: Make the trip educational by exploring the Oak Grove Nature Center while at the park, free with park entrance. Open weekends 12 noon to 4pm. Now that you’ve worked up an ample appetite it’s time to chow down at one of the city’s most popular brunch spots, Midtown Creperie & Cafe on Stockton's Miracle Mile. Request a table out on the side patio.They have turned their alleyway between buildings into a cute bistro hideaway. The mural alone is worth the wait. If you like to start your mornings off with something a little sweeter and maybe a pick-me-up, dive into the Dixieland Crepe. This crepe is filled with crème, topped with fresh strawberries, whipped cream, and Ghirardelli chocolate! Desiring something savory? Don’t leave without trying their Neutral Ground Crepe or Vieux Carr Crepe, both are delicious! Pro move: Try the beignets with gravy. It is the perfect combination of sweet and salty. Walk off your brunch with a stroll around the Miracle Mile. It’s easy to get lost in the beauty of the many specialty shops and boutiques. Make a day of it and see all the locally owned and operated restaurants, galleries, and vibrant nightlife. Pro move: Enjoy some delicious coffee from House of Shaw while you explore The Mile. This itinerary is just a sample, there are other attractions and activities that can be substituted based on your preferences and time of the year. You can always text our team 8am to 8pm, seven days a week for additional recommendations. You can also discover something to do in Stockton every day of the year by checking out our events calendar today! Follow us on Facebook, Twitter, and Instagram - and use #VisitStockton during your visit!